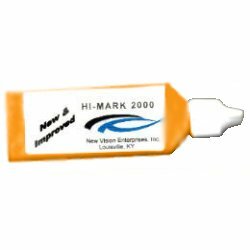 Hi-Mark 2000, new and improved, easy to use tube, environmentally safe. Makes marks you can feel. Do-It-Yourself-Kit for people with vision problems. Makes 3-dimensional bright orange, fluorescent marks. Adheres to most surfaces: paper, metal, cloth, wood, glass and hard plastics. Before writing, clean surface and dry. Make short, thick lines, dots or other shapes. Let dry for a few hours. Hi-Marks will not stick to flexible plastic.